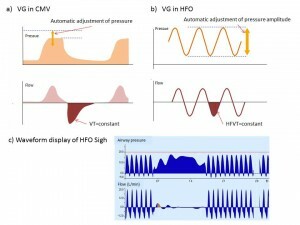 Sigh function is a function to increase the intermittent PEEP regularly in CMV (conventional mechanical ventilation). When the sigh function is activated, the PIP rises also by the value of the intermittent PEEP (Figure 1). Sigh function can be set with “Interval Sigh”, “Cycles sigh” (how many mechanical ventilation cycles are covered to increase PEEP) and “ΔintPEEP”. Lung recruitment can be expected and it possibly prevents high PEEP. “Cycles sigh” to increase PEEP, does not include support ventilation by PS during SIMV. 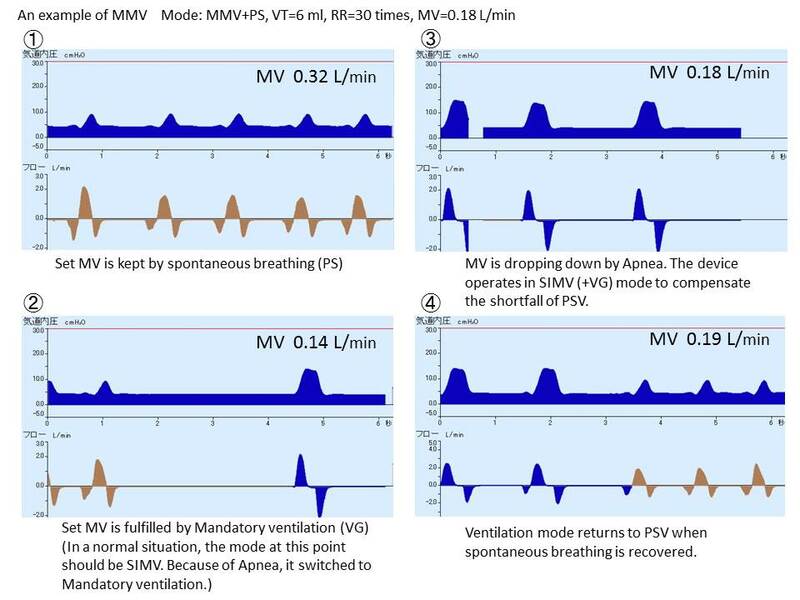 Apnea ventilation cannot be used in MMV mode because apnea time is not available. MMV is Pressure Control ventilation to ensure minimum minute volume. This mode is not just a pressure controlled mode, Mandatory ventilation is fully controlled by VG (Volume Guarantee). 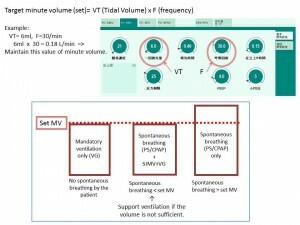 The Minute Volume is equal to the product of VG and Mandatory breaths (Figure 2). For example, when the set minute volume is fulfilled with PS, the device provides no Mandatory ventilation. On the other hand, when the set minute volume is not reached by PS only, Mandatory ventilation will be provided. If the patient became Apnea, it would be switched to the Mandatory ventilation of VG (Figure 3). There is case report that MMV achieved lower airway pressure ventilation than SIMV (synchronized intermittent mandatory ventilation). In case of a wail, for instance, when the minute volume rises dramatically by spontaneous breathing for the meantime, it is necessary to monitor the SpO2 drop because there is no mandatory breathing provided until Minute Volume drops down (even if the patient became Apnea) . 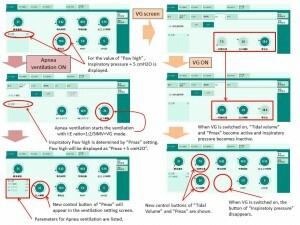 In the previous Basic course, it was suggested to switch on “Pmax/Paw high autoset” (Paw is linked to Pmax) (System setup “Ventilation setting”  “General setting”). Further explanation is added in below. 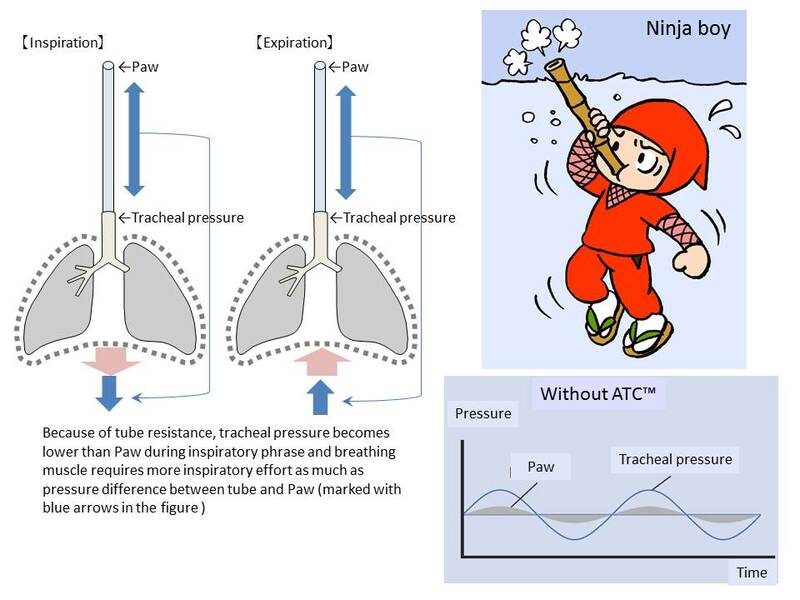 If the setting “Pressure link” is switched OFF; 1) if the user needs lower ventilation pressure immediately during SIMV more, Inspiratory pressure cannot be lower than set Paw. 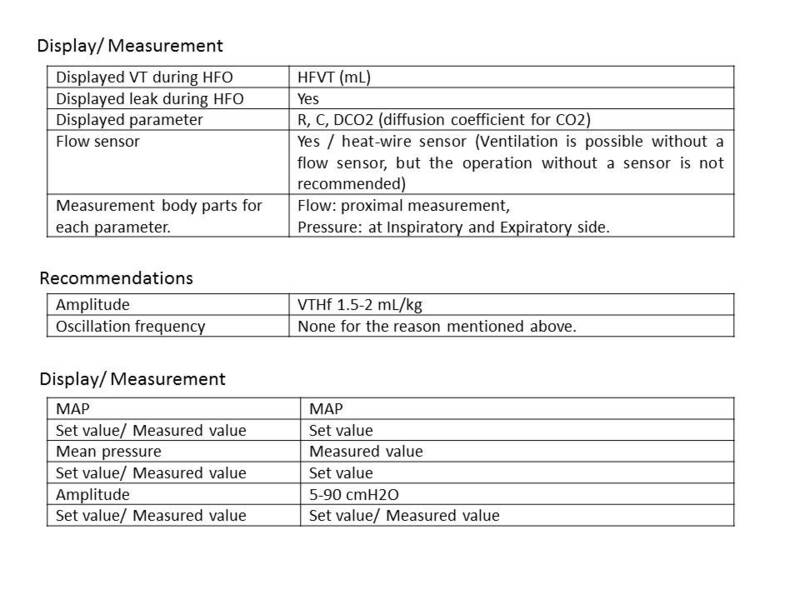 To set Inspiratory pressure to be higher than Paw, the user has to adjust the alarm setting beforehand, 2) With VG on, the maximum inspiratory pressure limit will be automatically “Paw (alarm setting)－5cm H2O”. Because this value won’t be displayed in the ventilation setting screen, there is a risk to set up too high value for the pressure. On the other hand, when “Pressure link” is ON; it is possible to set Paw alarm setting the system setup. As low as the Paw setting is set, Pmax will be lower accordingly. 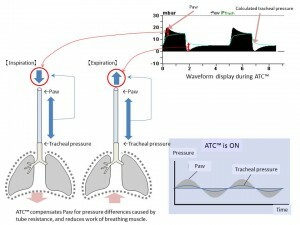 Paw high is constantly set as “Inspiratory pressure + 5cmH2O”, and it is displayed at the left corner of ventilation setting tab in small size (Figure 4). 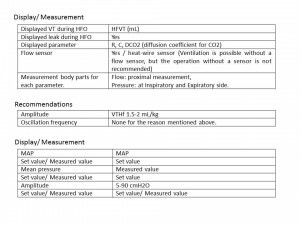 If Apnea ventilation or VG is ON; there is additional setting item called “Pressure limit” besides Inspiratory pressure. “Pressure limit” means the maximum inspiratory pressure limit for VG, Apnea ventilation and MMV setting. “Paw high” equals “the pressure limit + 5cmH2O”. 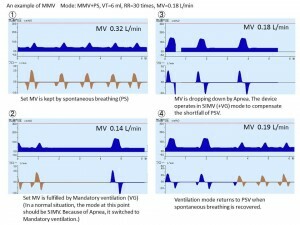 Figure 4 shows ventilation setting procedures to switch regular SIMV mode to Apnea ventilation or VG. 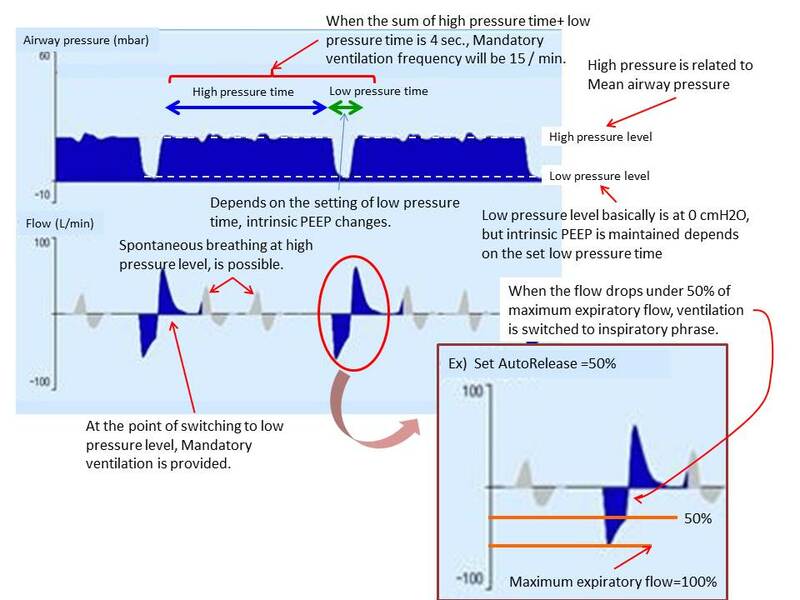 When Apnea ventilation is active, the set pressure limit will be displayed in the ventilation setting screen. In addition to that, set Tidal volume will be also displayed and set Inspiratory pressure will be hidden (Figure 4). When the maximum inspiratory pressure rises higher than 30cmH2O, the warning message “Inspiratory pressure > 30?” will pop up (no matter what alarm settings are), and it is possible to set higher value. For Pressure limit, this warning message doesn’t appear in the screen. The pressure high limit does not apply to the maximum pressure during HFO. 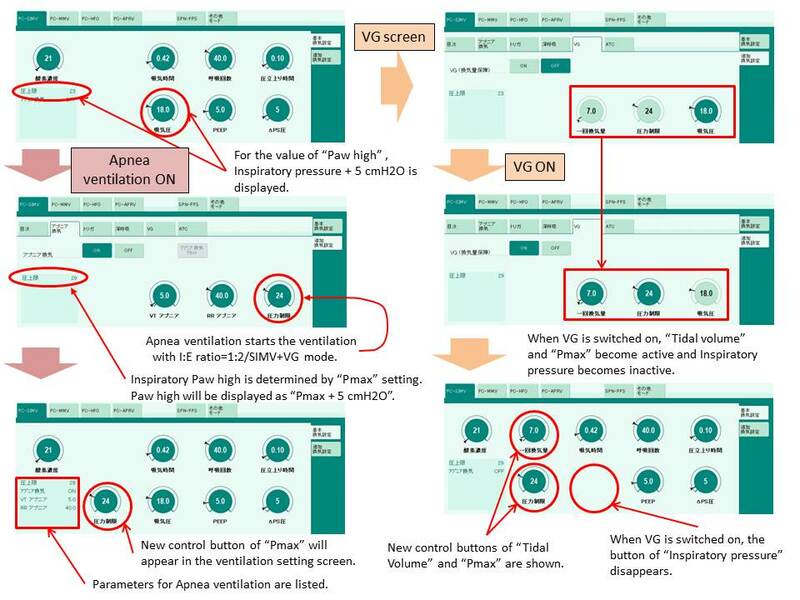 Apnea ventilation starts the operation in SIMV+VG mode with I:E ratio＝1:2. As it is described in the Basic course, because the condition of Automatic return from apnea ventilation is very strict, the user needs to deactivate Apnea ventilation manually in most cases. Because I:E ratio of Apnea ventilation is 1:2, it should be careful to set up fewer frequency which may extend the Inspiratory time. For instance, the setting of RR=40 /minute determines Ti=0.5 sec. On the other hand, Ti with the setting of RR=20 /minute, will be 1.0 sec. Because PPS™ requires spontaneous breathing, Apnea ventilation setting is essential for Apnea. But since the required condition for automatic return is high also possibility of manual return is high, the user needs to pay attention to operate PPS™. HFO function of this device is improved compare to previous model, Babylog8000plus. With Babylog8000plus, HFO amplitude was adjusted by HFO oscillation frequency. VN500 allowed users to set absolute value for amplitude directly like other products, (Table). Also, VG function for HFVT even during HFO mode, is now available. Standard VG keeps constant VT by adjusting inspiratory pressure. 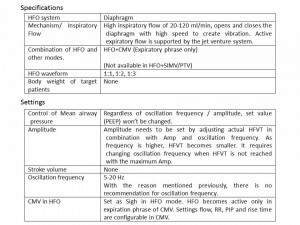 On the other hand, HFO VG adjusts pressure amplitude automatically to keep constant VT. 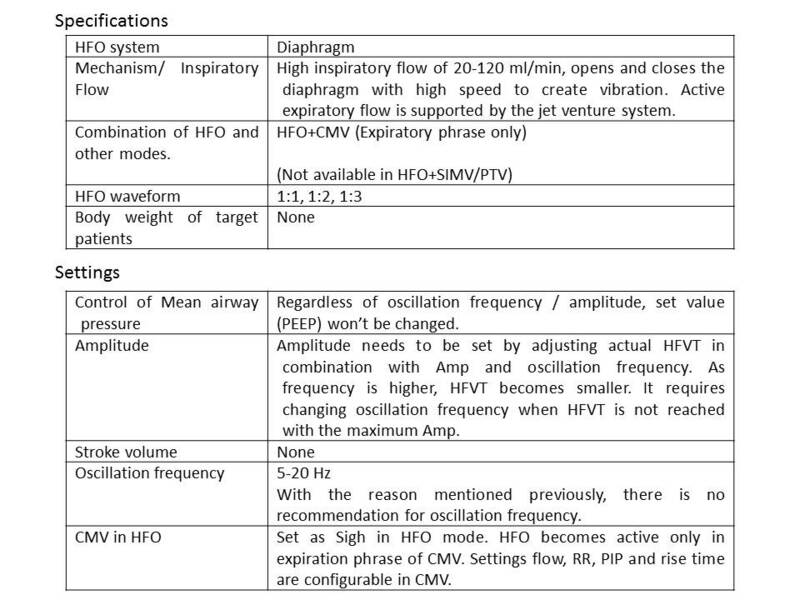 Maximum amplitude of HFO should be set as well as HFVT setting (Figure 5-c). Sigh function during HFO mode is also available. 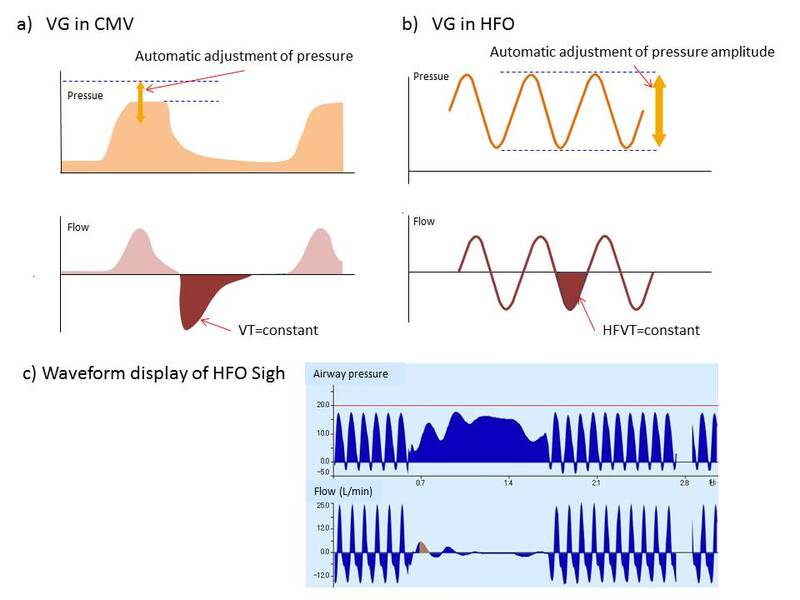 However, unlike the Sigh function which rises total PEEP in CMV, sigh function during HFO mode operates more like CMV+HFO of Babylog8000plus (Figure 5). 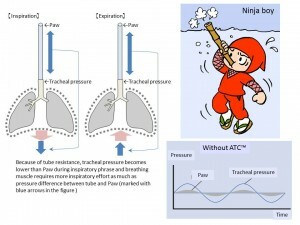 APRV（airway pressure release ventilation）is new ventilation mode which provides continuous positive airway pressure and it offers pressure release regularly to balance oxygenation and ventilation. This mode has beneficial effect on lung recruitment and allows spontaneous breathing 2). Setting parameters are ”Pressure” of high and low level and “Time” of high pressure and low pressure. The ventilation cycle is determined by the sum of high pressure time and low pressure time. Low pressure level is normally set 0 cmH2O. Low pressure time should be set as short as 0.2-0.8 sec to maintain the intrinsic PEEP. 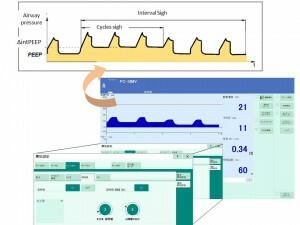 AutoRelease function allows to set the percentage (app.50 – 75 % in general) by which the expiratory flow must fall short of in relation to the peak flow, the ventilation to switch to Inspiratory phrase. This function also adjusts low pressure time automatically. It might be easier to understand to say that this AutoRelease function is the reverse version of Expiratory termination in PSV. Ventilation through small tube requires strong breathing effort. ATC (Automatic Tube Compensation) is a function compensating the tube resistance. Spontaneous breathing under an intratracheal intubation requires greater inspiratory effort for the tube resistance. It also needs greater expiratory effort for the resistance during expiration. With ATC, the device calculates the pressure for compensation by the inner diameter of the tube and flow. During inspiratory phrase, airway pressure is reduced to compensate the resistance and vice versa during expiration phrase. By compensating the tube resistance, ACT reduces breathing effort. In the screen, actual airway pressure is shown as the standard waveform. Calculated tracheal pressure is shown in a green line. ATC would be better off to switch off with the amount of leaks is too much because it is not compatible with them. Unlike other standard ventilation mode, it assists lung elastance and airway resistance separately. During PPS™, ATC™ compensates only resistance of an intubation tube. On the other hand, PPS™ compensate airway resistance only, exclude resistance of a intubation tube. While ATC™ is OFF, PPS™ compensates the total resistance of an intubation tube and airway. Regarding the accuracy of compensation for tube resistance, ATC™ is better. 2) Shinichi Watanabe. Actual APRV management for neonates. Neonatal Care. 26 (1). 2013, 38-43. 3) Infinity Acute Care System: Babylog VN500 Instruction for use. 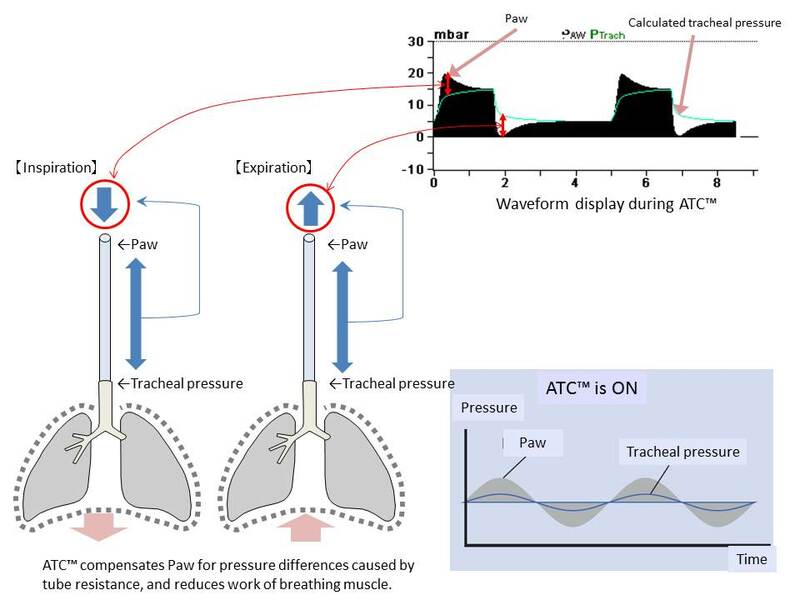 Dräger Medical Japan Ltd.
4) ATCTM and PPSTM Breathing Support with Optimum Patient Comfort. Dräger Medical Japan Ltd.